Work on the National Register of Citizens (NRC) in respect of the eastern Indian state of Assam bordering Bangladesh, is proceeding at a feverish pace regardless of its domestic and international consequences. Undertaken with the intention of identifying ‘illegal immigrants’ from Bangladesh since 1971 and removing them from Indian citizenship, work on the NRC could create a huge class of ‘Stateless persons’ because Bangladesh will refuse to take the ‘illegals’ back. And since the bulk of the ‘illegals’ are Bengali-speaking Muslims, it could lead to communal violence as indeed the issue did in 1979 and 1983 (the year of the Nellie massacre which claimed 2000 lives). Facing hostility in Assam, which has been a feature of the State since 1979, those not in the NRC will try to migrate to other Indian States which too will refuse to take them since most of them harbour fears of Islamic extremism. The Indian State, as such, has become paranoid about Islamic extremism as the refusal to absorb Rohingya refugees indicates. And India does not have a policy of absorbing refugees. Therefore, those who have sought refuge have to lead a life without rights and in fear of arrest. The governments of India and Assam have assured that no genuine Indian citizen, who can establish his right as per set of criteria, will be excluded from the NRC. The governments also contend that the second draft list published in July is not the final one and that the final one will be decided only at the end of 2018. But this is poor consolation for the affected people, because the second draft excluded four million persons, mostly Bengali Muslims, Bengali Hindus, Biharis and Nepalese who have been living in Assam for decades. Members of the family of former Indian President Fakhruddin Ali Ahmed have been left out. An Assamese BJP MLA, Ramakanta Deori, did not find his name in the NRC draft. Another BJP MLA, Dilip Paul, found his wife’s name missing. A retired soldier of the Indian Army, Anzar Hoque, is not in the list. 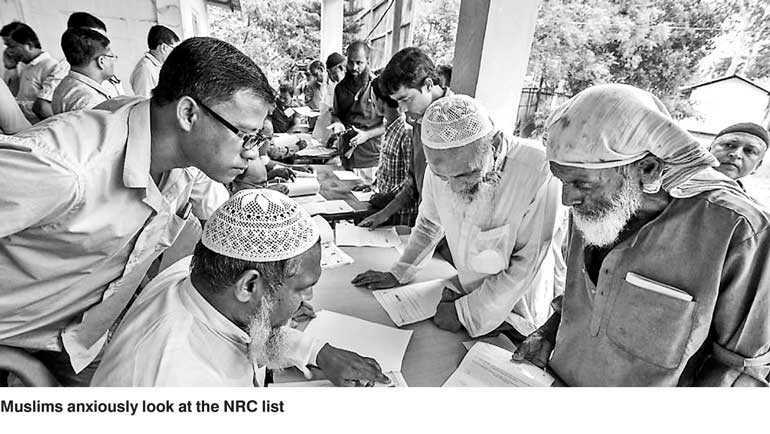 Both the ruling Bharatiya Janata Party (BJP) and the opposition Congress Party are committed to the compilation of the NRC. But since the bulk of the ‘illegals’ are Bengali speaking, the neighbouring State of West Bengal will be under tremendous pressure to accommodate them. Aware of this, the fiery Chief Minister of West Bengal, Mamata Banerjee, has warned of a communal ‘bloodbath and a civil war’ if Bengali Hindus and Muslims are expelled from Assam. Bengali-speaking Muslim immigrants from Assam, West Bengal and Bangladesh are believed to have spread out all over North India. Their exact numbers are not known, but the figure that it commonly bandied about is two million. If there is a communal conflagration over this in Assam, after the release of the final list at the end of the year, it could spread to other parts of India given the growth of Hindutwa radicalism, intolerance and violence across North India since the BJP came to power in New Delhi in May 2014. 2019 will be an election year, with parliamentary elections expected in May. And with elections will come nationalism, communalism and jingoism as per the pattern set by the BJP and its family of Hindutwa organisations. This will trigger a conflict with Bangladesh. Bangladesh is a friendly country as on date, but it has had a history of communal volatility which had led to forced migration to India periodically. Jehadism is a new factor to contend with, though the present Sheikh Hasina regime is keeping it under control. Communal violence will invite censure from international organisations and Western governments wedded to the promotion of human rights. India will be hard put to it to defend itself and manage an international crisis of this sort. Those who had come from Bangladesh as illegal immigrants, had fled from war, religious persecution and economic distress and are among the poorest of the poor. Driving them out by legal or illegal means would be replicating the Rohingya expulsion model followed by Myanmar. With the Indian parliamentary elections expected to be held in or before May 2019, political parties are aiming to create or capture vote banks. Given the fact that the NRC is being created to address the concerns of the majority Hindu community in Assam about illegal immigration from Muslim majority Bangladesh, both the BJP and the Congress have been supporting the compilation of an NRC. While the BJP is aiming to retain its support among the Hindu Assamese, the Congress wants to re-capture the community. This is why the leader of the Congress in Assam, Tarun Gogoi, loudly protested against West Bengal Chief Minister Mamata Banerjee when she warned that the NRC will lead to ‘bloodbath and a civil war’ in India. Gogoi asked Banerjee to ‘mind her own business’ as she does not belong to Assam. It was the Congress which promised to weed out illegal Bangladeshi immigrants in Assam by signing the ‘Assam Accord’ in 1985 to end an anti-illegal immigrants agitation which started in 1979. But the conditions stipulated for registration are onerous and anybody can be left out. The NRC requires documentation about permanent residence in Assam before 25 March 1971, the cut-off date agreed upon in the Assam Accord of 1985. But for the poor and illiterate masses across communities, producing documentation dated 47 years ago is a very difficult task. The complexities of paperwork are another problem. The Assam government provided the format to establish family trees going back till 1951 or earlier. But one had to produce documents to establish that connection. But as one writer pointed out, if there was a spelling error or a mismatch, you were sunk. Repeated summons to the local NRC office would follow. India may create a new category called Stateless persons. India is now averse to accepting refugees as the rejection of Rohingyas shows. Not to have thought about these things before beginning the NRC exercise is a grave mistake, veteran journalist Sanjoy Hazarika says. “Have our strategic thinkers been so obtuse as not to have seen this coming, given what Assam has suffered over the past 50 years?” he wonders.